Brunch Fave: Sausage & Cornbread. So can you tell bread was one of my favorite things before living a low-carb lifestyle? I’m telling you, I could turn anything into a sandwich. Sandwiches – no one in particular – were my favorite food and I’d have them often. That’s why so many of my last meal remixes have included keto bread. It must be a craving coming to test my will. Today, I put a twist on one of my favorite college brunch items: sausage and cornbread. The original recipe comes from an old friend and roommate. With a single box of Jiffy cornbread mix, baked over cooked, crumbled breakfast sausage, the epic breakfast dish is ready when golden brown. Instead of using the keto bread recipe to make biscuits or buns, I spread the uncooked dough over spicy crumbled sausage I’d prepared in the skillet. I doused the sausage with cayenne pepper, black pepper, and Italian seasoning as it sizzled in the heat, so this dish was going to have just the right amount of kick. If you can make it spicy? Make it spicy. Let the dish bake until golden brown and spread REAL butter over the top before letting it rest. After about ten minutes, cut and serve with sugar-free syrup. This looks like a heavy meal, right? I was pleasantly surprised at how light the meal was; the complete opposite feeling of the one you have after eating the original recipe. I had two pieces in the beginning and felt completely satisfied – not too full – after I’d finished them. We love to make this and bake the mixture in cupcake baking sheets. You get the perfect single serving if you make it this way. Side item? Scrambled eggs and spinach cooked in bacon fat. I’m having a low-carb, deconstructed chicken sandwich this afternoon. I was inspired to come up with something new because S is having low-carb biscuits and gravy. While I do love the biscuits and gravy recipe we use, it’s heavy on the dairy side of life, and I need to stay away from that to keep feeling light and healthy. My body doesn’t tolerate dairy very well and since cutting it out of my diet over a year ago, I feel so much better on a daily basis. If I do have some dairy? I have some kombucha and get back on my mostly-dairy-free train. To start, I fried a few chicken thighs in beef tallow using our home deep fryer. S had already made the keto bread so this was ready to go by the time my chicken was finished and ready for seasoning. Next? We slice the bread in half and add some homemade spicy keto sauce on each side. Continue on to debone each thigh and chop, together, with spinach. Add your preferred seasoning – I used a mixture of cayenne, lime juice, and a pinch of garlic salt – and place the chicken spinach mixture on top of the keto-sauced bread. At the top of this idea, I thought I would be able to mix the spinach and chicken, and make a sandwich with no issues. The mixture turned out to be a tad too unruly to rest calmly between the keto bread slices, so this is how the deconstructed version of this snack came to mind. How was it? Absolutely DELISH. I enjoyed it with a crispy tequila water on the side. A powerful LCHF (low carb, high fat) dinner. Breakfast for dinner has always been a family favorite. 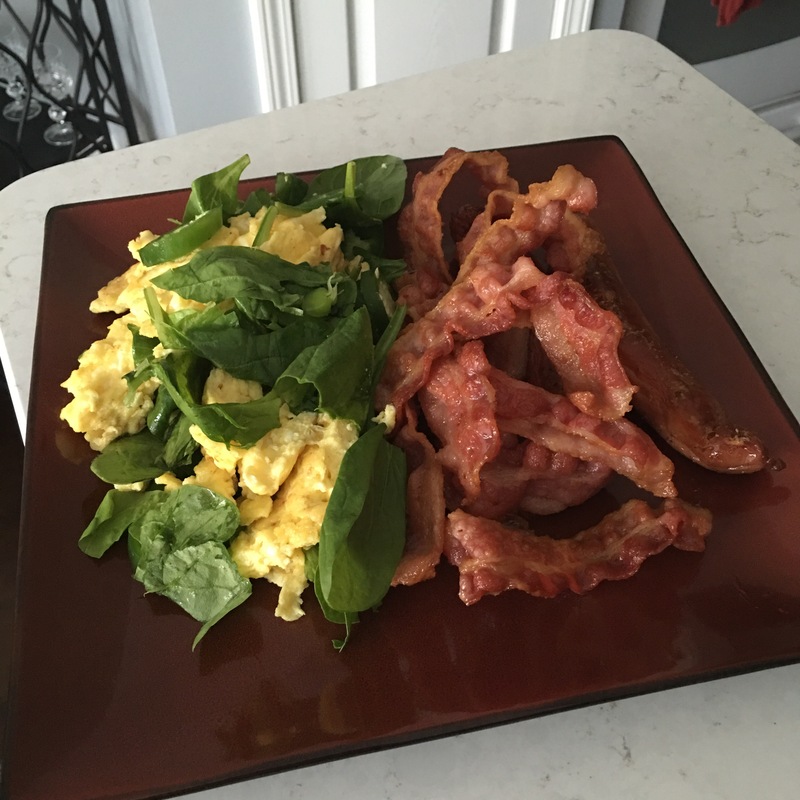 Bacon, a couple sausages from the local butcher, eggs scrambled in bacon grease and tossed with spinach and jalapeño. I’m already full.